Guests that love to spend their vacation time on a relaxing Disney Cruise will be interested in knowing that a new themed bar recently opened near the shores of Castaway Cay, Disney's private island. 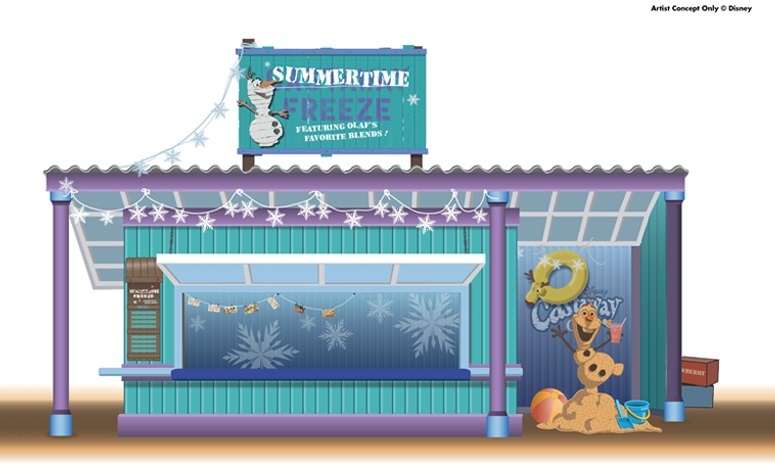 Located off of the Pelican Point tram stop and near Buy the Seashore and Flippers & Floats, the Summertime Freeze smoothie bar is now open to all Guests. Olaf’s dream of relaxing in the summer came true when he set his snowy foot on Disney’s Castaway Cay. Utterly charmed by the happy snowman’s enthusiastic pursuit of summer fun, the proprietor of Castaway Cay’s smoothie bar renamed the establishment “Summertime Freeze” in Olaf’s honor. Decorated with remembrances of Olaf’s many adventures, the smoothie bar features Olaf’s favorite smoothie blends, such as “Warm Hugs,” “Worth Melting For” and “Olaf’s Flurry Freeze." ARTWORK/PHOTO: ©2015 Disney. All Rights Reserved.